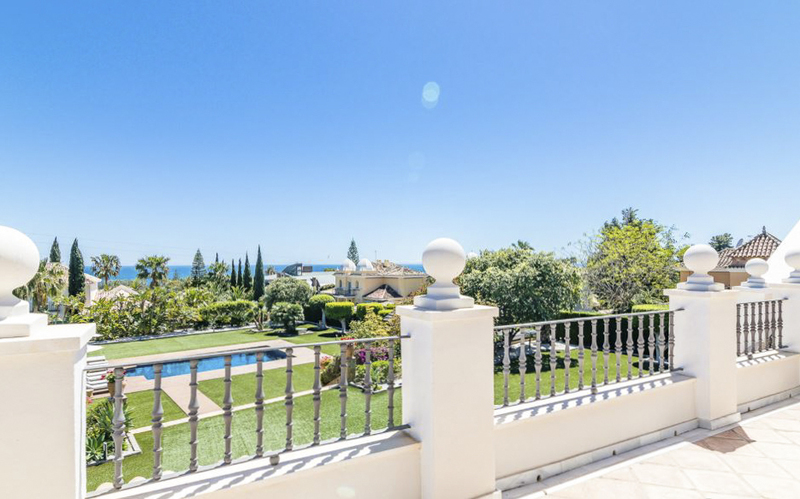 A stone’s throw from Puerto Banus and with breath-taking sea views, Besitos Villa is an exquisite, unique home-from-home, just a 15-minute stroll from the beach! 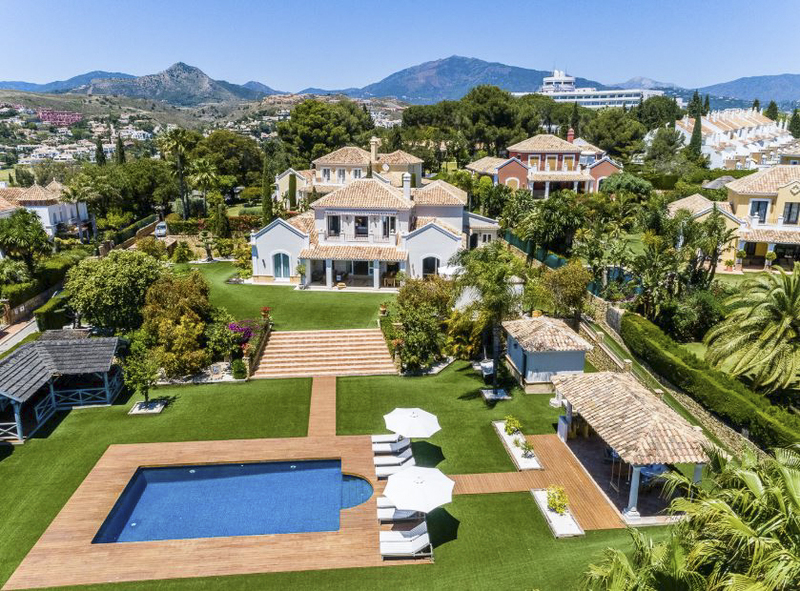 The exterior is utterly magnificent, a bold façade of pearly white against a backdrop of towering mountains and endless blue skies set among a surreal, intricately landscaped garden of pool-houses, flowerbeds and of course, the vast private pool! 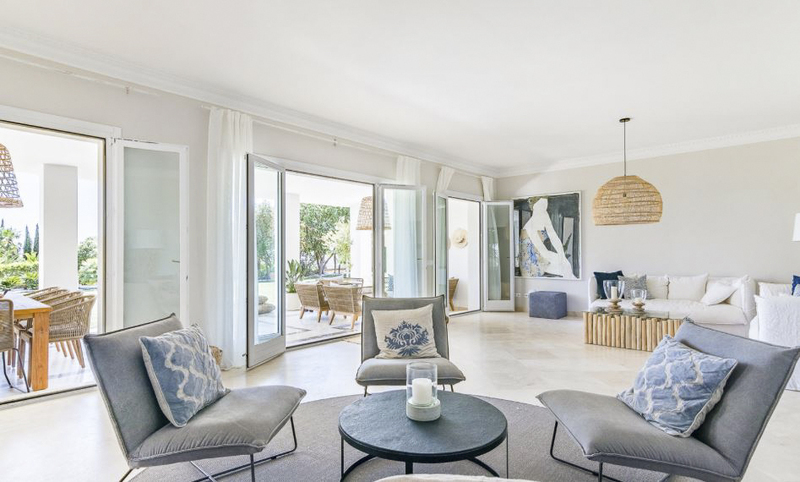 Stepping inside, you will witness the result of hours of loving dedication to the décor, design and furnishing of this villa in a perfect Scandinavian styling. 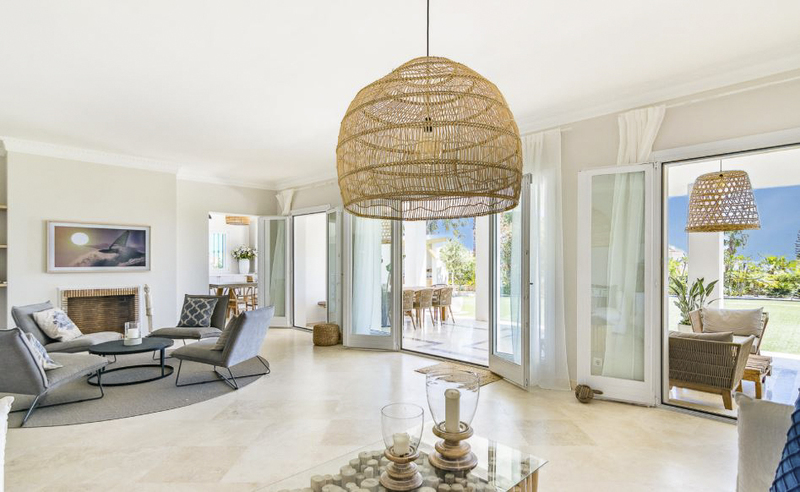 The vast, south-facing living room enjoys sunshine all day long, filling the room with a beautiful, warm glow. 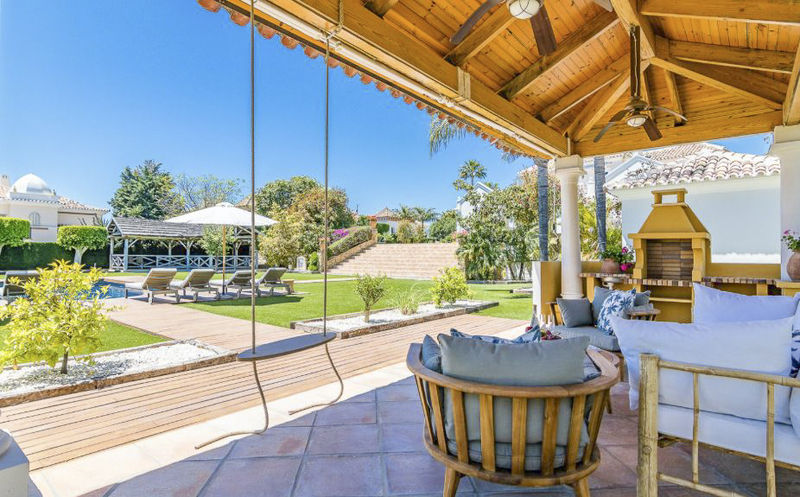 Overlooking the pool and garden, and directly opening onto the terrace, you can sit back in one of the beautiful armchairs or on the cosy sofa and soak up the scents and sounds of the garden beyond. 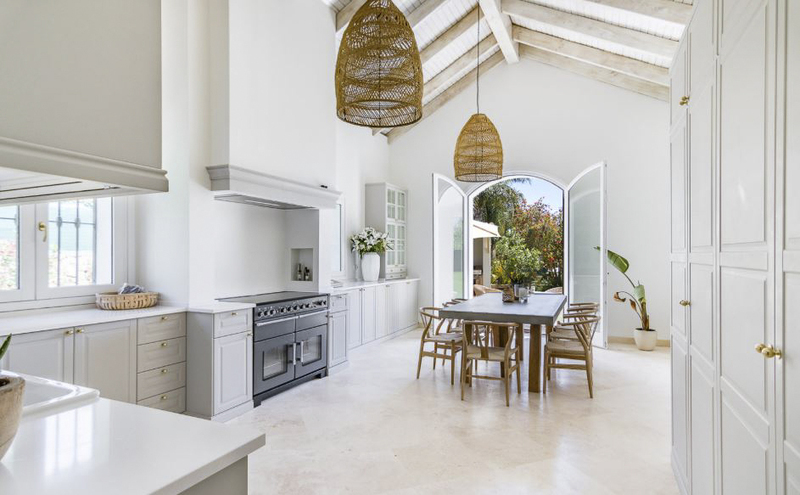 The stunning kitchen, with a double height ceiling and range cooker, is fully-equipped to fulfil all your culinary desires – while also enjoying direct entry into the garden, outdoor kitchen and fabulous alfresco dining area! 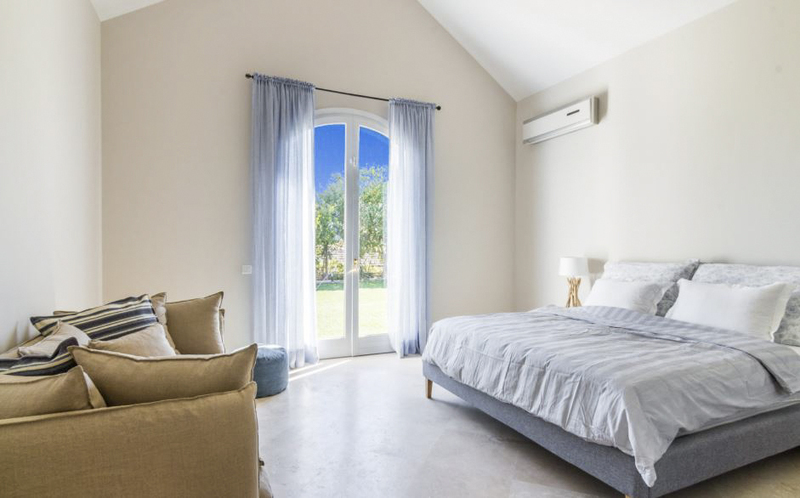 Air-conditioning and WiFi throughout will keep you cool and connected to the outside world! In total, there are five great bedrooms. The first three are found on this ground floor, while the final two are on the first-floor. 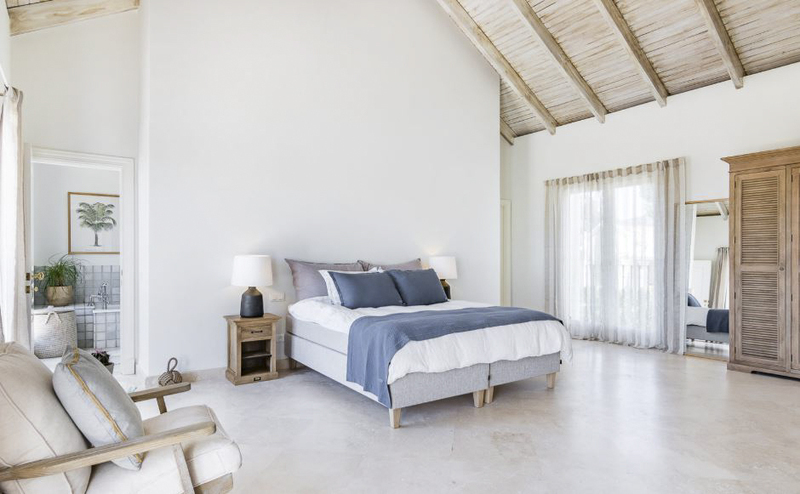 The master suite, on the first floor, is incredibly spacious and features a fireplace, a private terrace with fantastic sea views and a lounge area. 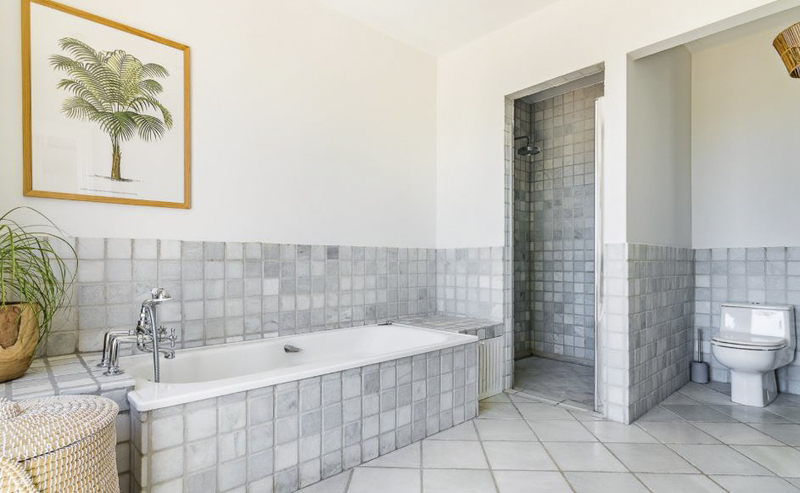 All five rooms are accompanied by a wondrous ensuite bathroom, equipped with deluxe baths or showers. 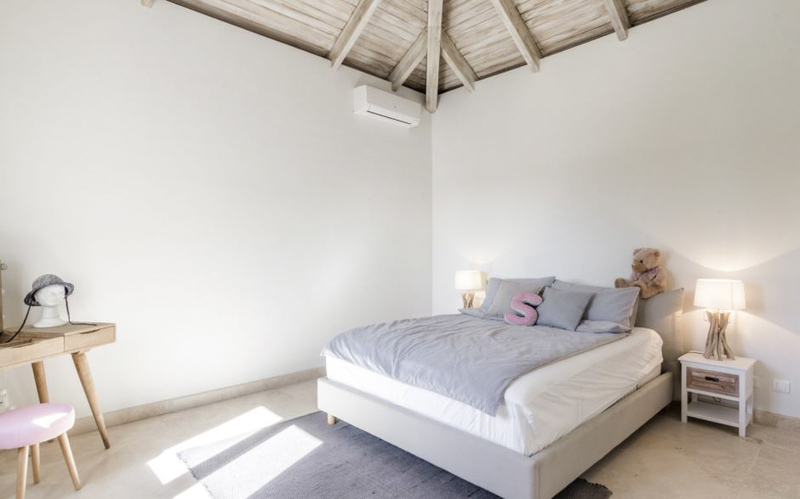 Two of the rooms also feature sofas which can alternatively be converted into sofa beds, ideal for families travelling with young children! 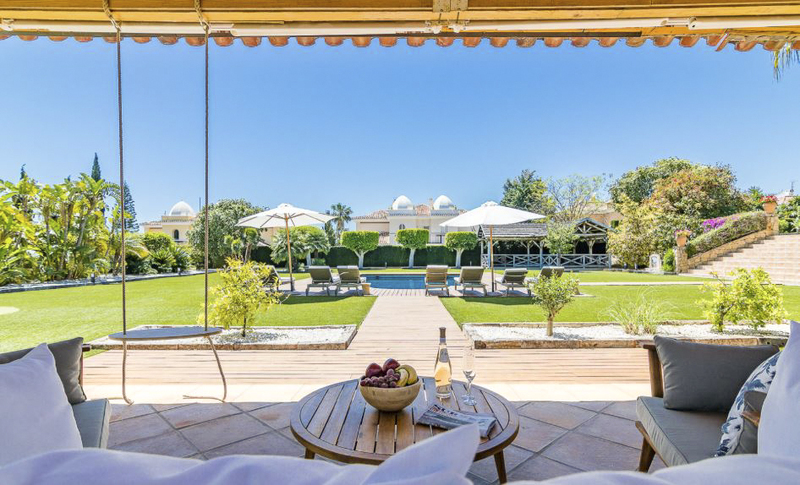 The enchanting garden is an exotic masterpiece which offers the discerning traveller just about everything they could wish for – be that a little practice on the putting green, an intense game of ping pong on the table tennis set or merely a calm snooze in the hammock, you can enjoy it all in your luxurious private space. 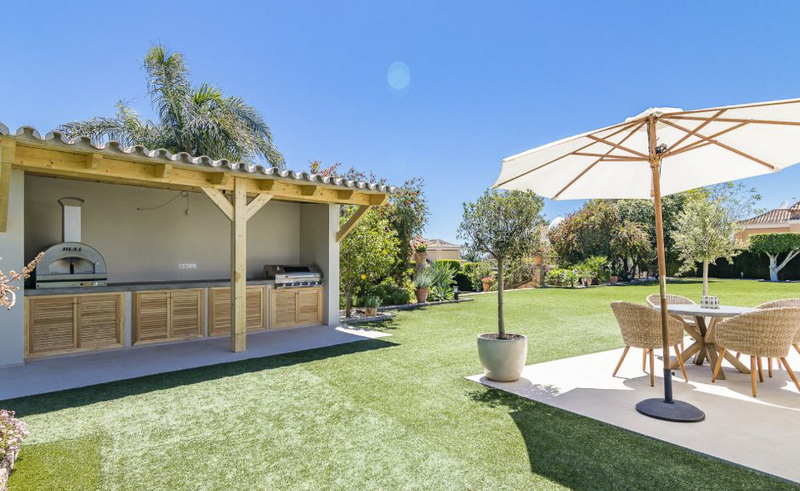 And, of course, let’s not forget that fantastic private swimming pool which sits majestically at the far end of the garden, surrounded by incredible hang-out spots, alfresco dining areas and plenty of loungers for a little sunbathing. 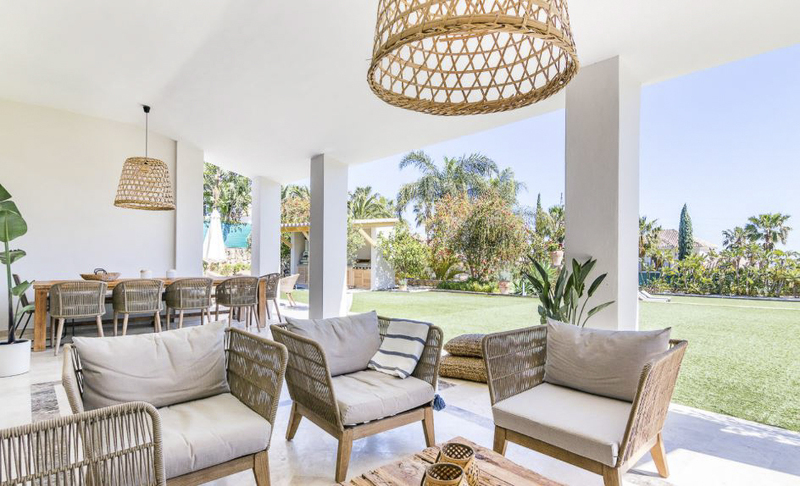 Beautifully tucked away in the foothills of the distant mountains, you’re guaranteed total peace and tranquillity throughout your stay – and yet, just a 15-minute walk away is a fantastic beach and within just a short drive you have access to some of the most famous and beautiful beaches of the Costa del Sol – including San Pedro, only 5 minutes away! 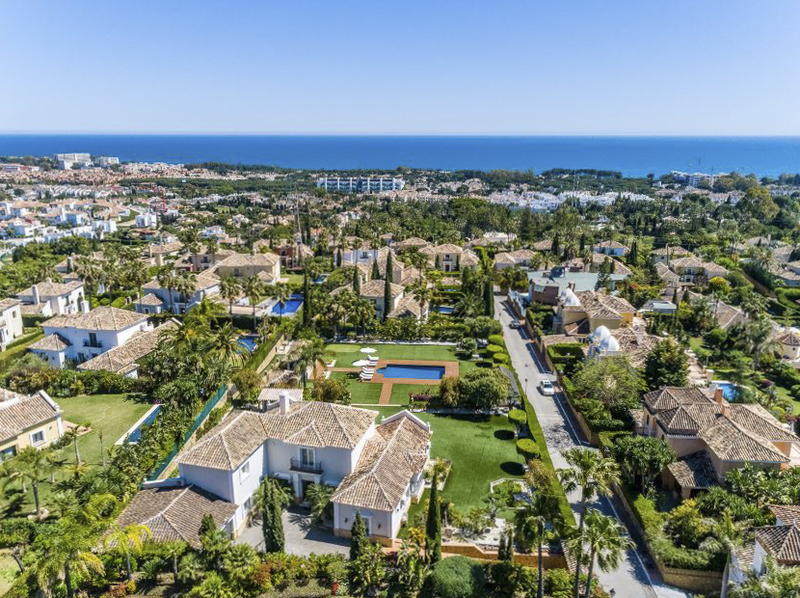 Within 10 minutes you can reach Puerto Banus – famed not only for its magnificent beach and boardwalk but also its high-end retail and restaurant offerings. The sublime natural landscape that envelopes you as you lounge by the pool or gazes out of the vast windows creates the impression that you’re utterly detached from the real world. 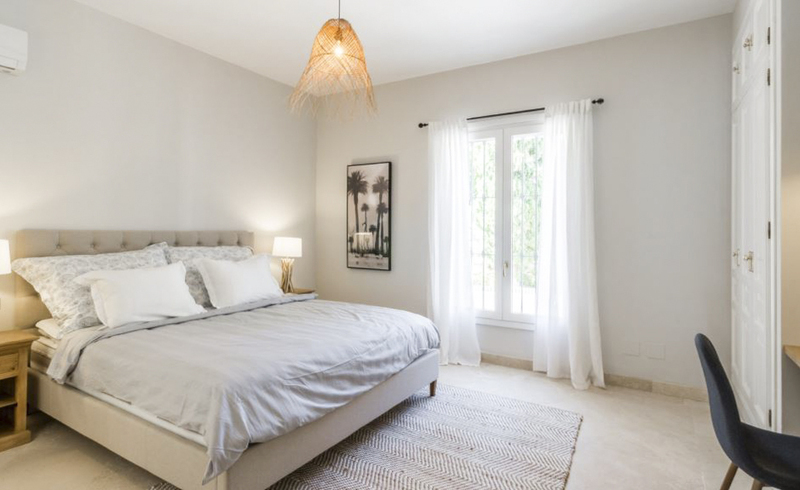 Besitos Villa has located just a short drive from Puerto Banus, brimming with luxury brand boutiques, markets, restaurants, clubs and bars and of course a beautiful harbour.